My husband has a few dishes that he is really, really good at. I loooove it when he decides, usually on a Sunday, to make one of those few coveted dishes. One of them is Mac n’ cheese. He is always great about sprucing it up with additional ingredients, and this time it was cauliflower and bacon. 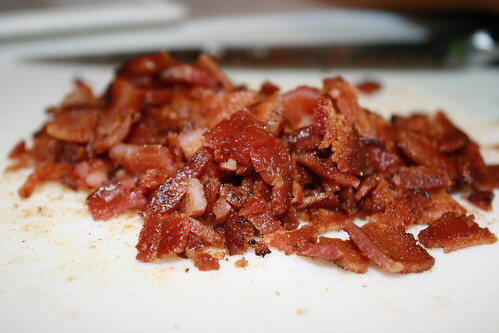 I love the bacon, but if you are a vegetarian it is really easy to omit this and have just as delicious a dish. He chose to include the cauliflower because I brought home a 5 lb cauliflower head! 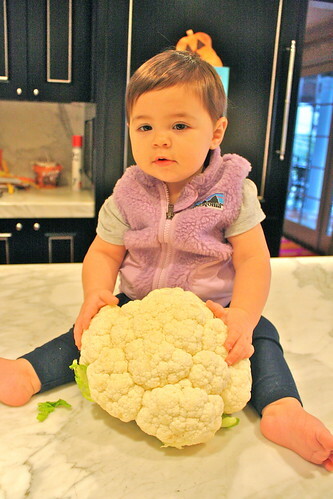 My kids saw all of these huge cauliflower in the store and they went nuts! I couldn’t help it- I found one of the bigger ones and hauled it home. The 4 cups of florets called for in this recipe didn’t even make a dent! I am sure that I will have to find more cauliflower dishes to make in the next week. But until then, this will have to tide you over. 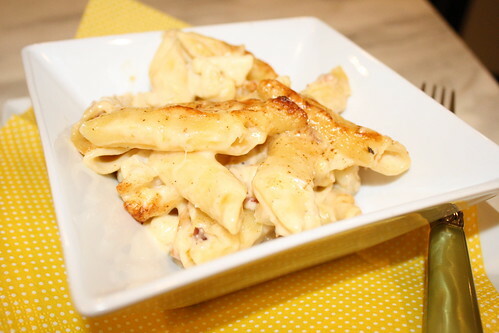 Penne, tender cauliflower, salty bacon and a wonderful, rich and creamy sauce with a hint of red pepper. Delicious. 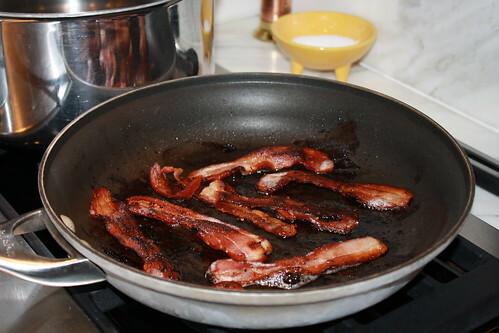 In a large pan, cook the bacon over medium heat, rendering all of the fat and cooking until crispy. Drain the bacon and chop. Set aside. 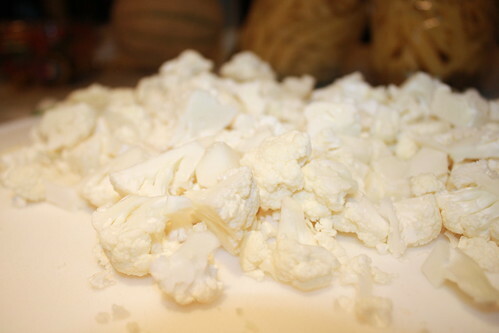 Put the cauliflower florets in the boiling water and let simmer 60-90 seconds. 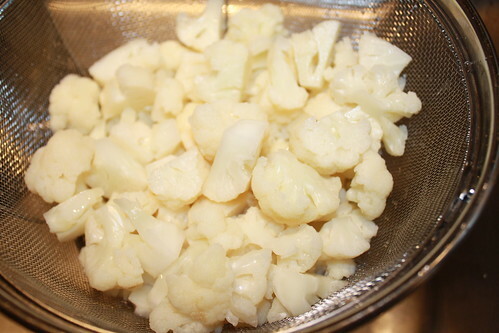 Remove the cauliflower with a strainer or slotted spoon and rinse with cold water in a colander. Meanwhile, melt the butter in a heavy pot. Add the flour and using a whisk, mix the butter and flour together until it smooth. 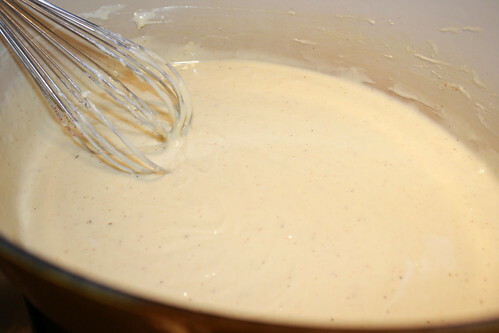 Let the sauce cook for about 4-6 minutes or until the sauce is still pale, but the raw flour taste is gone. 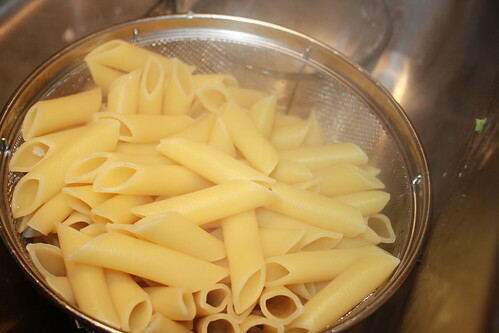 Add the pasta to the boiling water, and cook it a few minutes less than al dente. Meanwhile, add the milk to the roux, and stir well until all of the lumps are out. Add the cheese, red pepper and garlic powder. Stir really hard until the sauce is smooth. Season to taste with salt and pepper. Drain the penne when done. In the large pot with the sauce, mix the pasta, cauliflower and bacon with the sauce. Toss to coat. Prepare a 9×13” glass pan, greasing it with a tablespoon of butter. Add the pasta, cauliflower and bacon, all tossed in the sauce to the pan. Top everything with the remaining 2 oz of shredded jack cheese and sprinkle it with chili powder. 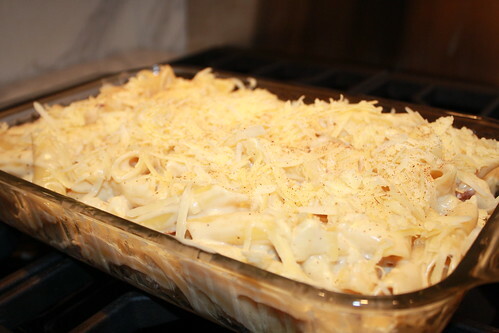 Bake the Mac n’ cheese at 350 degrees for about 25 minutes or until the top was golden and crispy on top. Fantastic! I can make it both ways; half with bacon for my husband and the other half veggized for the kids and myself. If more men knew how cooking up a dish makes their beloved’s hearts go pitter-patter, they’d race to the kitchen! One of my husband’s dishes is Indian Cauliflower and potatoes, Aloo Ghobhi. It’s great during cold weather. Oh, I made spinach lasagna roll ups last night! Took thirty minutes to put together and all the kids loved it. Vicki- I have been hunting for a good version of that exact recipe! Any chance he would share it?! 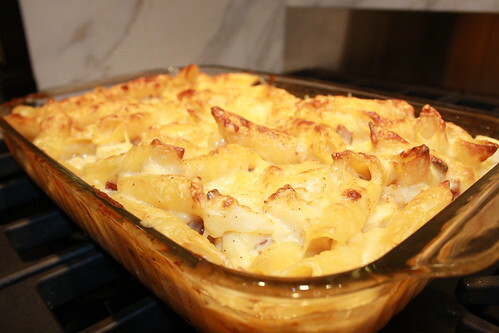 This is a delightful recipe – a cross between cauliflower casserole and mac ‘n cheese…with BACON!! Pete prepared what will be a southern delight at a church pot luck this weekend. 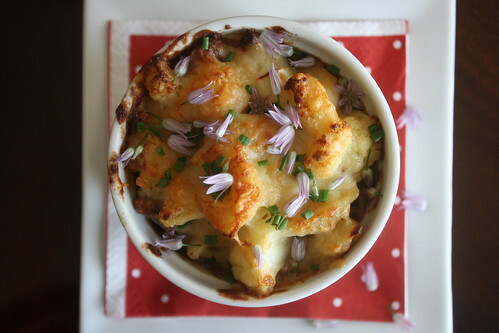 Gruyere cheese and cauliflower is a perfect combination. I will let you know if my casserole dish comes home empty. The cauliflower is beautiful! I’m heading to Whole Foods in Atlanta tomorrow and hope to find nice fresh veggies. Oh my my my my my. Bacon, noodles and cheese? You can’t go wrong. Cannot wait to try this recipe! Now I know what we are having for dinner on Sunday – looks fantastic! Adore Miss Coco Cauliflower! Yummmmm! This reminds me of a dish our French exchange student made for us…about the same but without the pasta! Fabulous with a baquette (as if we needed more carbs!) I will have to make this recipe to take to our college girls on my next trip! I usually don’t like to try out new recipes when I throw a party, but I decided to go for it with this Mac and Cheese alternative! Well, this was an astounding hit! All of my guests asked for the recipe. Thanks for another great dish, Heather! This was so good! I’ve never made homemade mac and cheese before but the addition of bacon and cauliflower sounded so interesting. My family loved it–even my 14 year old who detests cauliflower ate it and said it was so good it covered the “cauliflower taste” –I could taste the cauliflower, though, and thought it was a wonderful addition. Yum! Another recipe to add to our rotation. Thanks Heather! This was delicious! 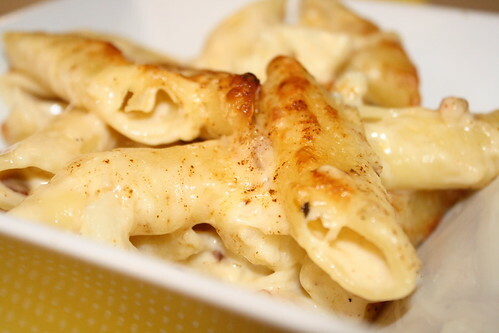 Finally, a mac and cheese recipe that is worth the effort! February 26, 2012 at 9:22 am	 Bonnie R.
Made this and of course it was delicious! A true comfort food. I loved the couliflower in it. Almost made it seem somewhat healthy. The leftovers reheated nicely too.